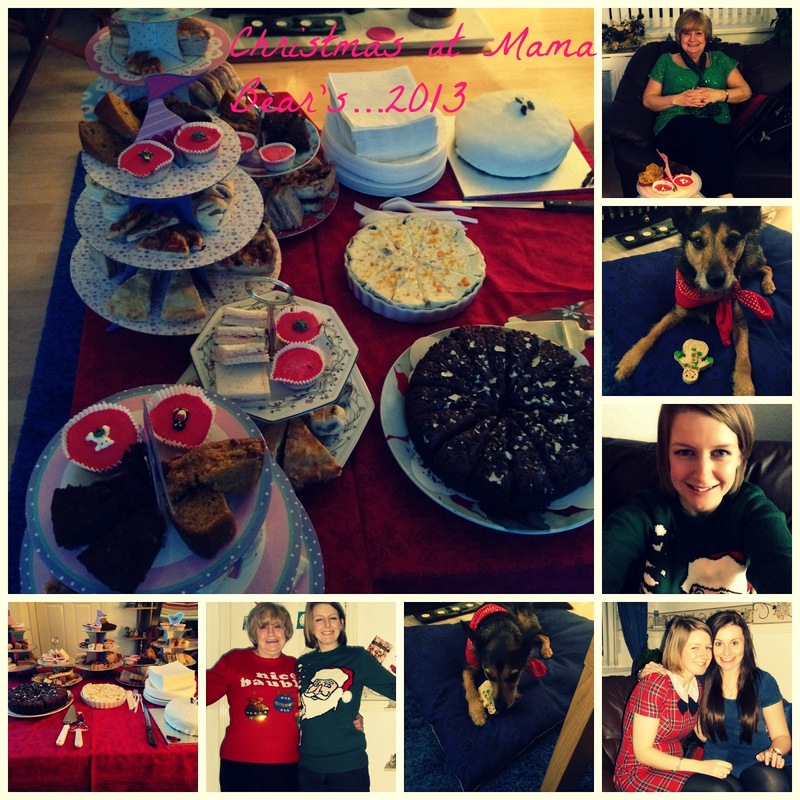 This was Christmas Eve, and some of Christmas day at Mama L's house. I moved in with my Mister three years ago, but I always go back home for Christmas...I couldn't imagine it any other way really. This Christmas Eve, we decided that we would make Christmas afternoon tea for the whole family (hence the cake-stands!! ), and it really was delicious. The only problem was, the house is too small to fit everyone in, so it was a bit of a squeeze!! My lovely VBF visited after the family tribe had left, and my pooch Jay-Jay really enjoyed the chewy snowman she brought him :). And you can also see Mama L and I fully embracing our Christmas jumpers :). 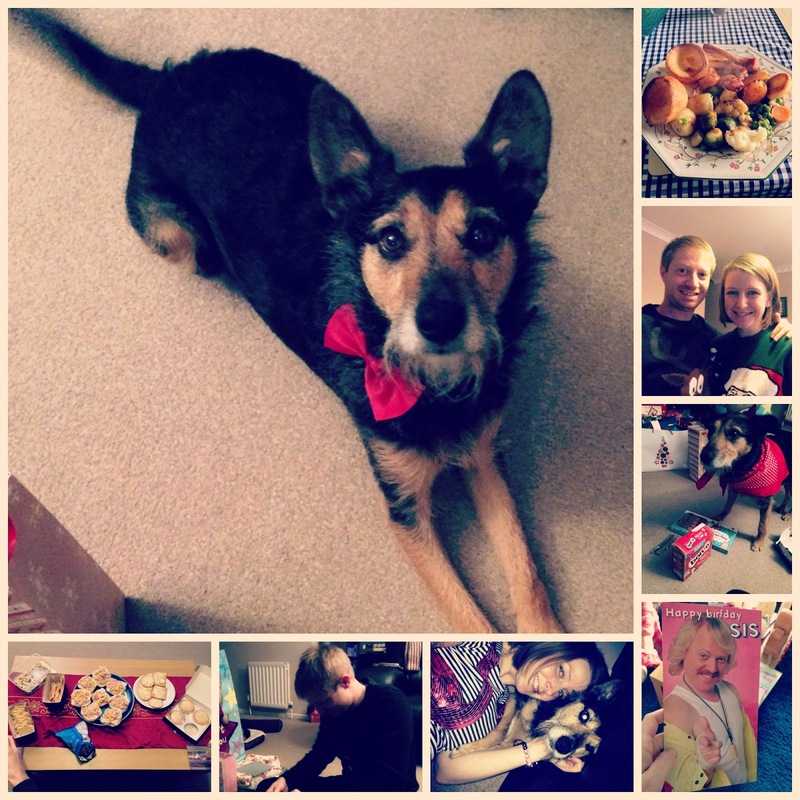 This little collage is a mixture of Christmas Day (which is also my birthday) and a sly photo from NYE!!! Jay-Jay is taking centre stage in his new bow-tie, a present from his Auntie Helen, doesn't he look handsome? There's also my wonderful Christmas dinner (cooked by Mama L), my Mister and I posing in our Christmas attire, Jay-Jay wondering what to do with his presents, my amazing Keith Lemon birthday card from my brother, an NYE cuddle from me and the pooch, Chris tearing into his presents...and our little Christmas Day tea...well it all revolves around the food doesn't it??!! Last but by no means least, I had to include some photos of the wonderful birthday and Christmas presents I received this year. 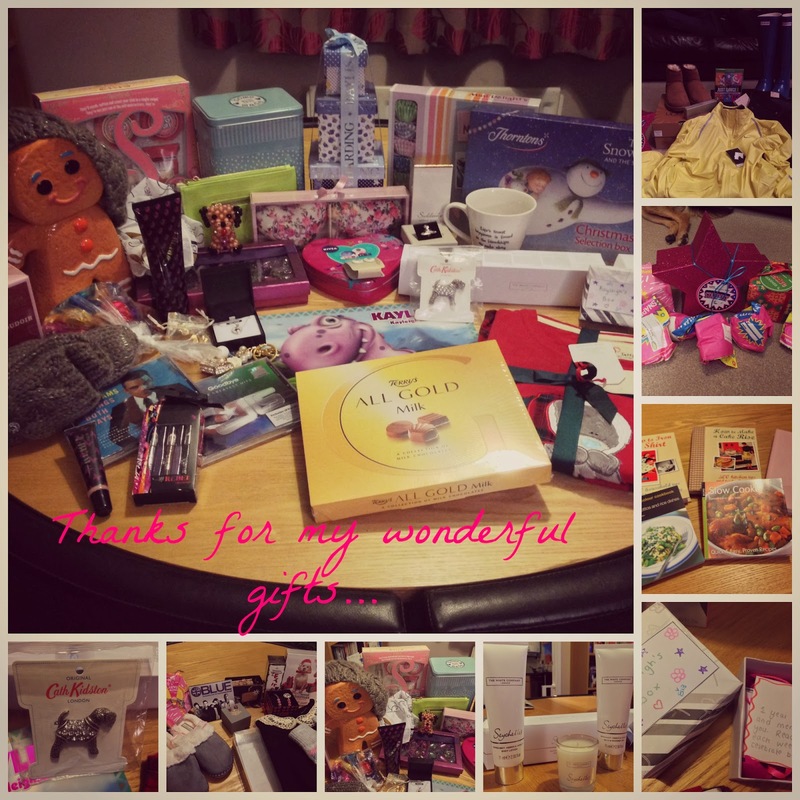 I am so grateful to everyone who was kind enough to buy me a present, and I really was spoiled rotten (as I am every year!). I'm not going to talk about all of the presents in turn, else we'd be here until next Christmas, but I've got to mention a few. First of all, my lovely Mister bought me all sorts...Uggs, Hunters, a running jacket, Just Dance for the Xbox (which was really entertaining on NYE! ), a gorgeous pair of skinny black Levi jeans and some Laura Mercier tinted moisturiser. What I love about his gifts are that he never ever asks what I want, he shops completely off his own back, and this year he managed to buy me everything that was on my 2014 wishlist (and more...!). He really is an absolute gem...and even without the presents he'd still be the most perfect boyfriend, but it was so lovely to see how much attention he must pay, to know what I really wanted :). My lovely VBF bought me some amazing stuff too; she knows me inside out! It's always great fun shopping for her presents, and she did amazingly with mine!! I loved all of them, but my favourites were my gorgeous Cath Kidston Stanley terrier brooch which she knew I absolutely loved, and my little Seychelles Christmas Cracker from The White Company...our favourite scent from the store. She also won the award for most thoughtful present hands down. She made me a little box of cards, one to look at at the beginning of each week of 2014. Each little card card carries a message or a memory of our friendship, be it something we've done or a wish for the future. This week's read "we like to be ladies and enjoy afternoon tea, cocktails and strawberry beer"...three separate memories of the last year rolled into one! A cute little message like that really helps brighten up a Monday morning I can tell you! I was so touched that she would go to all that effort for me :)...so if you're reading, fanks bestie ;). Finally, I want to mention my friend Michelle, who bought me a Chanel-esque scarf which is gorgeous, and she really made me laugh as she also bought me "Suddenly" perfume and attached a little message to the bottle saying "shhhhh! It's the Chanel No 5 smell-alike but if you hide it in your handbag, no-one will ever know it's not the real thing"...so thanks Michelle for helping me to live the dream on a budget haha! She also bought me a gorgeous Vivienne Westwood brooch and a beautiful beaded jewellery pouch, which I'm going to use as a clutch bag as it's too pretty to be left at home! Big shout out to Mama L too, who still buys the most amazing presents, even thought I'm now in my 28th year, she's a diamond! I crammed so much in over my festive break that its hard to remember everything, but I thought I'd close this post with a lovely SATC inspired moment. On January 2nd, I went to Durham for a lovely meal at Ask Italian with my friend's Sarah and Michelle, to celebrate Michelle's 28th birthday. We all work opposite hours, so it's a rare moment when the three of us can get together, and it was lovely to catch up on everyone's gossip. After our meal we popped into Ebony, Durham's lovely little Champagne bar, for cocktails and we spent the afternoon putting the world to right's. If 2013 was my year of friendship, then what better way to start 2014 than with cocktails and giggles? I think this year is going to be a very good year...cheers!